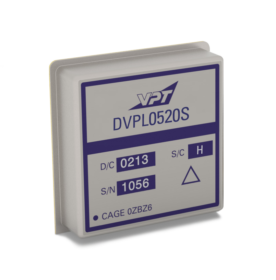 DVPL0520S Point of Load DC-DC Converter | VPT, Inc. The 20A DVPL Series of DC-DC point of load converters can be used alone or in conjunction with traditional isolated DC-DC converters as part of a highly efficient, reliable, distributed power system. The DVPL is a non-isolated, synchronous, buck regulated converter that steps down the voltage at the point of end use. The DVPL is the world’s first point of load converter that is designed and built to military-grade reliability as defined in MIL-PRF-38534. Use a single isolated DC-DC converter to power smaller DVPL POL converters at your loads, achieving significant savings in space, weight, heat and cost in your power system. To provide you with the most accurate data for the actual performance of this product once deployed, please note that the electrical performance data provided below is at Tcase = -55°C to 125°C, Vin= +5V ± 5%, full load, unless otherwise specified.